So for this years Halloween I decided to be a mermaid. I’m going out on Saturday night to a Halloween party put on by one of my fellow Rollergirls. 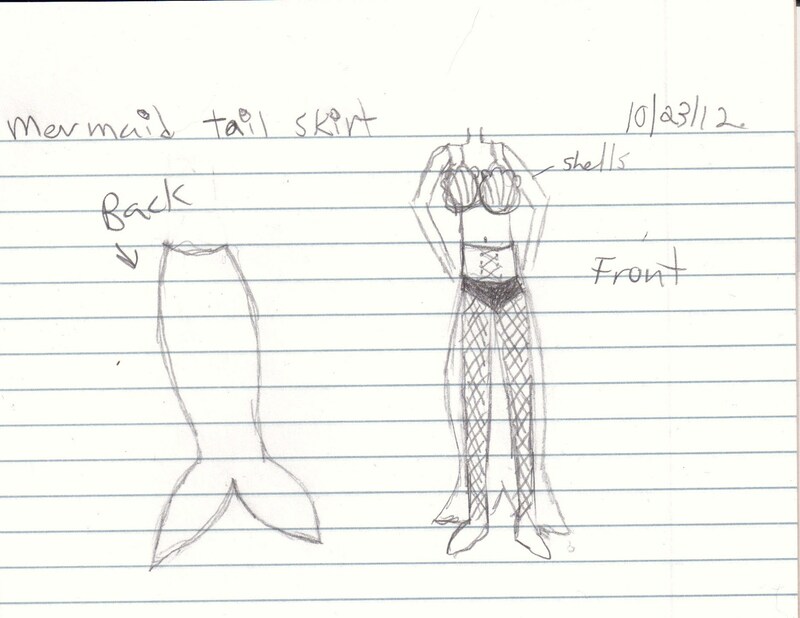 Here’s a really bad sketch of the costume idea. Basically the tail is attached via a wrap around high waisted belt. So the back looks like the tail and the front is just a belt. I’ll have tiny booty shorts on and some fishnet tights on underneath. 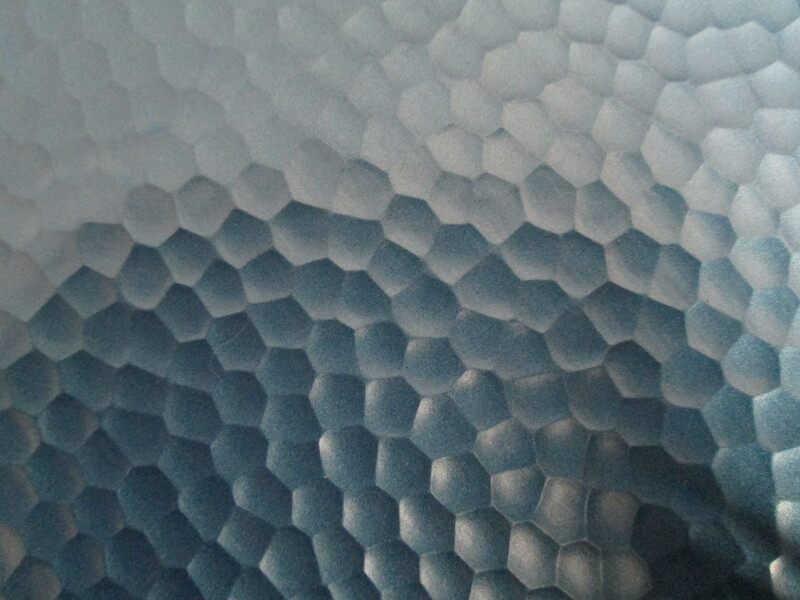 Then I’m going to use some craft foam to make the shells for the bra part. 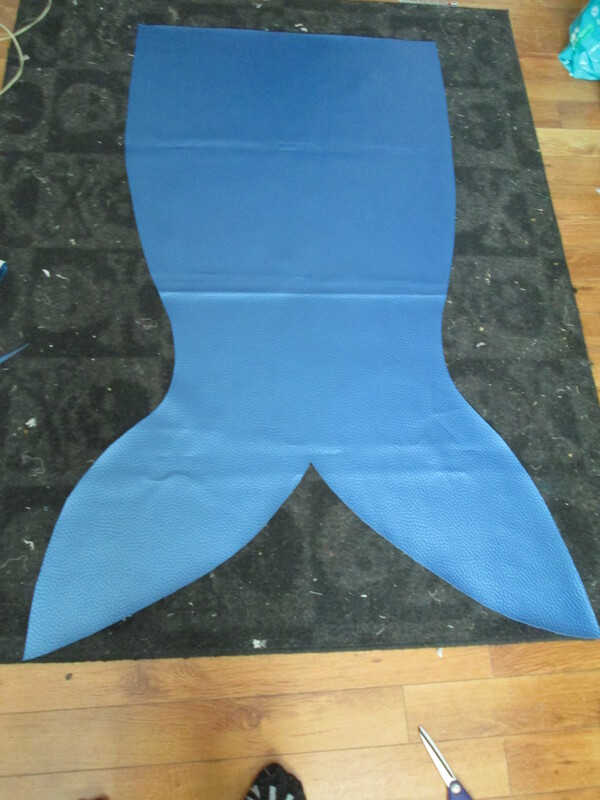 Here is the cut out of the awesome blue vinyl I’m using for the tail and a close up of the texture. I haven’t been keeping up with my WCD Blogs the last few months because my life fell out and I’m trying to get it back in order. I’ve been mostly making Pokeball backpacks they seem to be selling very well and I’m really excited about it. I’ve also been very busy with Roller Derby, I pasted my skills test and got drafted to a team. I am now a Hail Mary of the Arizona Roller Girls my first game is in September. I’m super excited. The grey fur were made because I thought that they would just slide on the floor instead of scuffing. No luck, after the first knee drop there was a huge hole in the front from where the fabric melted from the heat of the friction. The red and black ones looked great but didn’t hold out at all. I knew the red vinyl wasn’t strong enough but I didn’t think they would be riped off my skates. I know why these ripped apart, it was a design flaw. I didn’t have them on tight enough and the eyelets got ripped out of the vinyl. I have a new game plan for the toe gaurds and I’ll probably make another pair soon but for now I’m a little burnt on this project. So here are some progress pictures of the Pokeball Backpack commision I got two weeks ago at the First Friday Art Walk. I just finished the pattern and cutting out the fabric. The way I laid it out is wrong the red is the top so just ignore the layout. The Front that consists of four pieces; the top (red), the bottom (white), the middle (black), and the button (white) in the middle of the black. The there is just the back (white) and the sides (white) then the linging which will be red cotton. I’m planning on using 1 inch wide black nyon webbing for the straps and handle. The straps will be adjustable, per customers request. I’ve never made a round bag this big before so this should be interesting to sew. Plus it’s vinyl so that’ll make it extra tricky. I’ll be sure to post pitures of the finished product before giving it to the customer. I’ll probably have them on etsy as a custom order as well. Rising Sun iPhone Case & P.O.S. After making my Rising Sun Coin Purse I got a special request from a friend of mine to make a iPhone case and a P.O.S. (pocket on a string). Its the same design as the Rising Sun coin purse just a little bigger & with a strap. It was a bit tricky getting the the rays of the sun to look right on the larger P.O.S. size bag. All in all they came out great. 50% of the sale of these bags is going to the Japanese Red Cross.